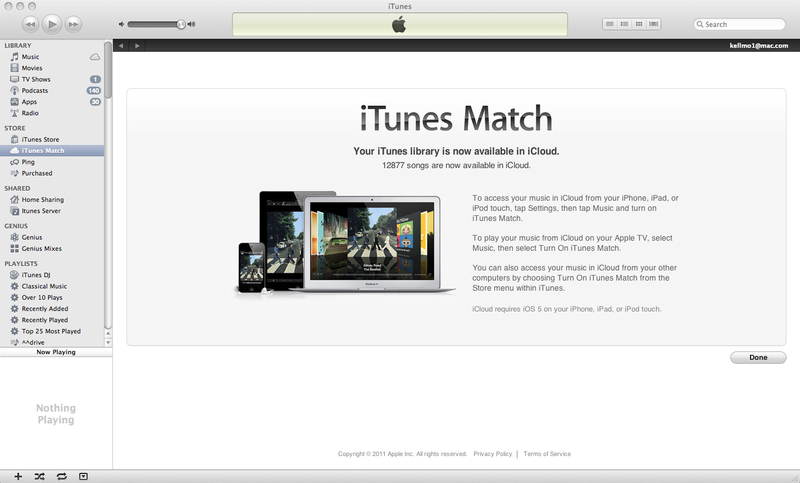 It’s been a long wait, but Apple’s music-in-the-cloud service is finally here with the introduction of iTunes Match. Like Google Music and Amazon’s Cloud Player, the service aims to give users access to their entire music libraries on any of their iOS devices or computers running iTunes. The new service will cost you $24.99 each year, but with that users can upload up to 25,000 tracks (downloaded from iTunes or otherwise) to the cloud and then access those tracks from up to 10 devices, which is pretty generous in our opinion. Songs that were purchased through iTunes don’t count towards the 25,000 song limit, which makes that number a little more bearable, and also gives users incentive to get their music through iTunes. One of the huge pluses of the new Apple service is that iTunes already has a catalog of more than 20 million songs, meaning that the process is a lot easier and faster than, say, uploading every single track you own to Google Music. Instead, any songs found in your music library that can also be found in the iTunes catalog (whether they were purchased through iTunes or not) will be matched up, meaning that the service only has to fully upload songs that aren’t found in the iTunes catalog. Those songs take a longer time to get into the cloud, but most songs that most people own will have a match within iTunes, making the process significantly speedier than its competitors. The service is available now to all users; after you’ve updated your iTunes to version 10.5.1, you’ll be able to purchase a year of iTunes Match. We went hands-on with the new service to see if it’s really all it’s cracked up to be. The process to actually get all of your music from your home-based music library (likely your home computer or laptop) has three different steps after you’ve purchased and launched iTunes Match. To purchase it, make sure you’ve updated your iTunes to version 10.5.1, then go into the iTunes Store and on the right hand side you will see a link to iTunes Match. Purchase the service with your Apple ID account and you can begin the process of getting your library up into the cloud. 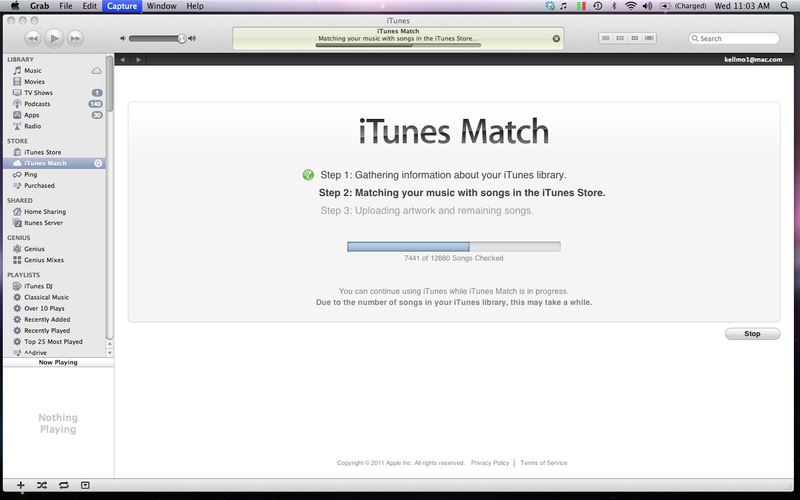 First, iTunes Match will spend some time getting all the information it needs about your library. The library that we used has just about 12,000 songs in it, making it no small feat for the service. After about 20 minutes of that first step, iTunes Match will move on to matching up your songs with songs in the iTunes catalog. For us, this step took the longest, at just about three hours. The final step is for the service to upload album artwork and any remaining songs that couldn’t be found in the iTunes catalog. The service had to upload 1,119 songs from our library that weren’t found in the massive iTunes catalog. Uploading each song during this step takes significantly longer, and it took at least another hour for iTunes Match to complete the process. During those three steps, we had to stop and restart the service twice because it seemed to get stuck. Luckily, both times the service picked up where it left off after we canceled and restarted the Match process. We weren’t too surprised by a few glitches since we were dealing with a rather large library of songs. After the process was finished, we got a notification that all of our songs were now in the cloud and would be accessible from iOS devices or other computers running iTunes. For most people, one of the biggest perks about iTunes match will be being able to access, play, and download songs from their cloud library to their iOS devices. We tested out the service from both our iPhone 4S and our original iPad. We ran into a few glitches along the way, but once those disappeared we got a pretty good look at just how Match works with your music in the cloud. To get access to your music library from your iPhone or iPad, all you have to do is go to music settings and slide iTunes Match and Show All Music to “On.” Once you do that, your cloud-based music should show up in your music library on your iPhone or iPad with a small grey cloud next to each song. When you select a song to play, the cloud will disappear and you’ll see a circle that documents the downloading process of the song. We noticed that there was about a 5-second delay in playing a song when it hadn’t been downloaded to our device already. Once you play a song, like it or not, that song will now take up space on your device’s storage. You can also easily select songs, artists, or albums to add to your device’s onboard (non-cloud) library by selecting “download all” next to that artist or album. To download songs to your device from the cloud, you’ll need a strong Wi-Fi connection, or if you’re using your iPhone, you can allow your device to use cellular data to download by sliding Use Cellular Data to “On” in your App Store settings. For users with unlimited data plans, this means that they should be able to download music from their cloud library anywhere and anytime. But for users who have limited data, we’d warn against turning that feature on if you don’t want to go over your limit. Our biggest problem accessing our music from our iOS devices was that a bug of some kind kept prompting us to enter our Apple ID password over and over again whenever we requested to play and download a song. No matter how many times we entered our password, the notification kept popping up. The service has no doubt had heavy traffic in the past few days, so maybe we can chalk it up to that. When we tried again after giving the service a rest for a night, the problem seemed to have disappeared. 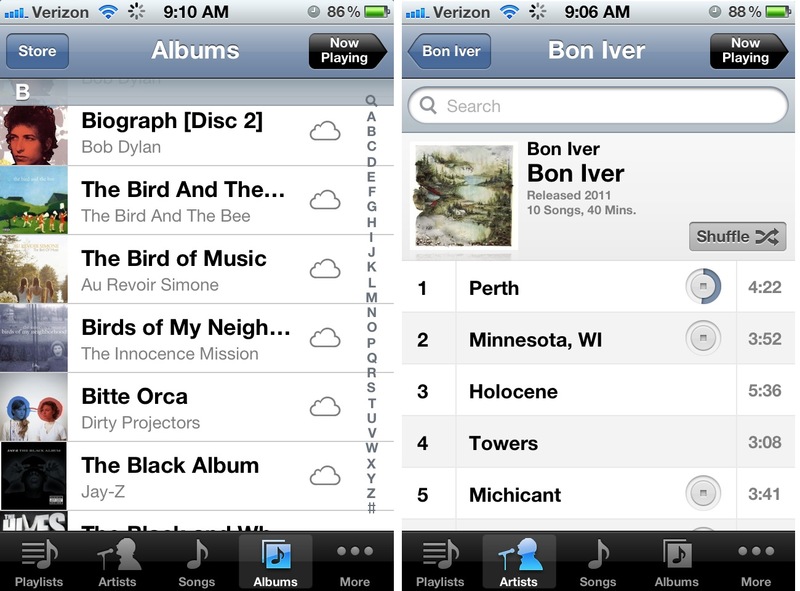 Users can also enable Automatic Downloads for music in the App Store settings of their iOS device. When enabled, this means that any time you purchase music through iTunes on any of your iTunes Match devices, that song or album will automatically be downloaded to all of your other devices. If you get all of your music from iTunes or like to purchase music on-the-go but want it to also be accessible from your home computer, this feature will be invaluable. For iOS devices, iTunes Match works almost like your own personal music store, instead of a purely music-in-the-cloud service. You can’t stream songs from your library from your iPhone or iPad without downloading them to your device. This could become a problem if you have a large music library, but only have a 16GB iOS device. It would probably take quite a while for that problem to occur, but when it does, you’ll be confronted with the pre-cloud problem of having to select which music you want on your device and what songs have to be exiled. A perfect cloud system would include a solution to this problem, in our opinion. While this feature might not be the most buzzed-about, it’s definitely the most seamless when it comes to our iTunes Match testing. We put the music library from our home laptop computer into the cloud for this iTunes Match testing, then added our work desktop to our iTunes Match account to see how it worked to have access to our whole home music library from work. When on another computer (after your original matching process has completed), running iTunes, as long as you are signed in with your same Apple ID, a screen will appear after you select the iTunes Match link within the iTunes store that says “Add this computer” instead of “Subscribe $24.99.” Click “Add this computer,” and after iTunes shows you a page like the one you started with (“Gathering information about your library,” etc.) for a minute or so, your music from the cloud will start showing up in your iTunes library, with the same little grey cloud next to each not-downloaded song. This is where iTunes Match functions the most seamlessly, and lives up to the music-in-the-cloud name. Once your cloud music shows up in your iTunes library on another computer, you can play songs or albums easily without having to download them, just as you would with a streaming service. We found that we could play whole albums without any delay, even though they weren’t downloaded to our work computer. This is the kind of functionality that we would ideally like to see for iOS devices as well. When we did choose to download whole albums from our cloud library to our work computer’s iTunes library, the downloads were fast and easy. Worth the wait, or an Apple misstep? While we definitely had some headache-inducing glitches along the way, we think that Apple is on the right track with iTunes Match and its capabilities. Once we got it to function, it functioned well and we can certainly see the benefit of being able to access your entire music library from any of your own personal devices. However, we don’t think they’ve quite hit the home-run that they are looking for yet. 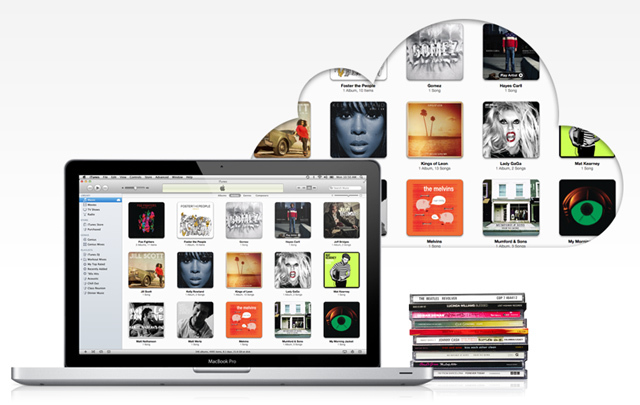 Apple definitely has the advantage when it comes to the original process of getting your music library into the cloud. The massive iTunes song catalog significantly speeds up the process, taking a total time of only a few hours for a large library instead of the solid week that it took when we tested Google Music Beta. It also benefits users by upgrading the quality of a matched song if iTunes offers a better-quality version than what was in the user’s library. From there, it is also pretty simple to activate the service on iOS devices or other computers. Our biggest problem with the service lies in the inability to stream songs from iOS devices without downloading them. 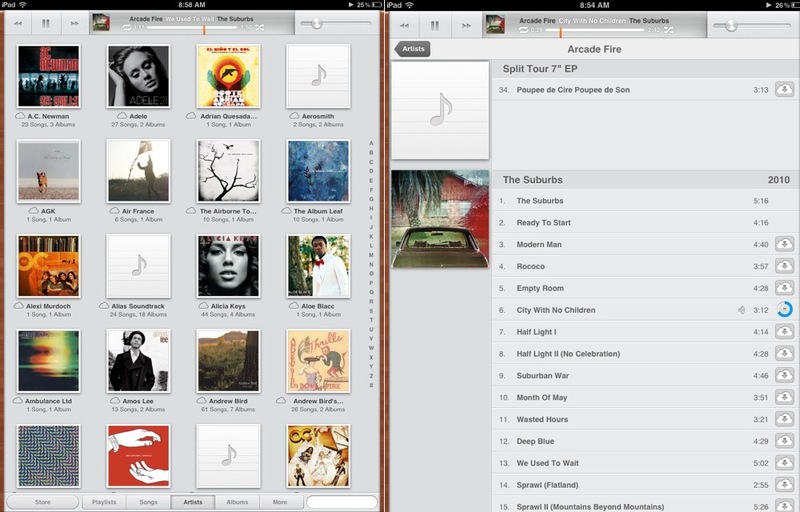 Eventually, we’d like to see iTunes Match function on iOS devices the same way that it currently does on other computers. Users should be able to stream any music from their cloud music library on their iOS devices without a hitch, and without having to download every played song to the device. Right now, that’s not the case. It may not be an issue for smaller users, but it will no doubt become a problem for anyone (like us) who has 60GB of music in the cloud and an iPhone with only 16GB of storage capacity. This doesn’t make the entire service a misstep, but it’s certainly something that Apple should be working towards if they want to blow past the competition and offer an easy-to-use and universally-liked service for Apple customers. After putting iTunes Match through all the paces, we’d say that it’s a good solid start for Apple, but they aren’t anywhere close to finished yet. For users, iTunes match is still a great service that offers numerous benefits for what we think is a very reasonable price tag of only $25 each year. While we do have criticism of the service in its current form, we are very happy to be able to access and download any music from our home library onto our iOS devices, even if there are a few small glitches in the process. We think Apple users will have similar feelings and be pleased with the service despite its few significant downsides.